Two firefighters and a neighbor were also stung and taken to the hospital. 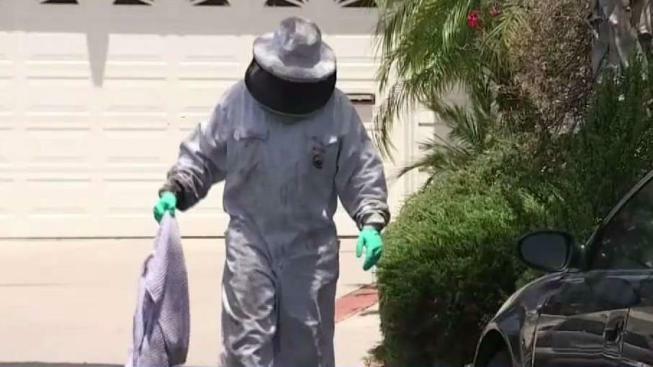 A woman remains hospitalized in critical condition after suffering over 200 bee stings in Lake Forest Monday morning, the Orange County Fire Authority said. When firefighters arrived to the 23000 block of Buckland Lane, they found "hundreds of bees" attached to the victim, OCFA Cpt. Tony Bommarito said. "Basically, she was literally covered from head to toe," he said. "Her face was completely covered with bees." Because of that, first responders bypassed normal protocols and jumped right in to save the woman without their usual protective gear. 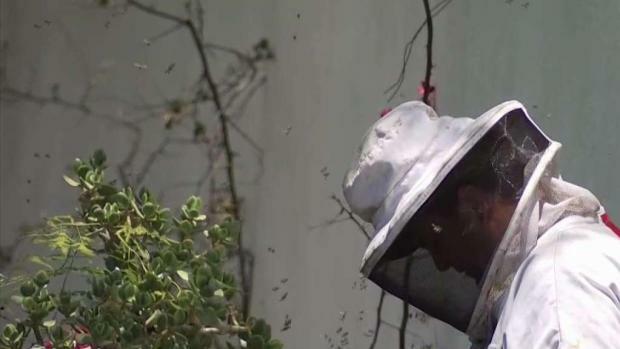 A housekeeper showing up to work at a Lake Forest home Monday morning was greeted by a swarm of angry bees. She is now in critical condition after being stung over 200 times. Kim Baldonado reports for the NBC4 News at 5 p.m. on Monday, July 16, 2018. "[The bees] were almost in clusters," said Ryan Wilson, one of the OCFA paramedics who responded to the scene. "Maybe the size of a golf ball all over her... she had them on her face, around her mouth, around her ears, her neck and her hair." The firefighters grabbed a carbon dioxide spray, sprayed the woman to repel as many bees as they could, and tried to carry her to safety, Bommarito said. She was described as "barely conscious" by the time she was rescued. "They made an excellent decision today," Bommarito said. "Unfortunately, they weren't fully protected." Wilson and three other firefighters were stung in the process. Two were transported to Saddleback Medical Center in Laguna Hills, Bommarito said. They were in stable condition and later released, and are already back on duty. A witness who was also stung was later hospitalized when she was having trouble breathing. A bee company was called in and was later seen removing buckets full of bees and beehives from the area. The victim, a cleaning woman in her mid-50s who worked in a nearby house, was in much graver condition due to the sheer number of stings she suffered, according to Bommarito. Despite the firefighters' best efforts, she was still covered in bees when she arrived at the emergency room. Her son, however, said she was expected to survive. "When you get somebody stung hundreds of times, [bees] injecting that venom, you're gonna have a serious issue," Bommarito said. "Anybody, allergy or not, is gonna be in serious condition after that."